Still haven’t mastered the act of closing your baby’s stroller with easy maneuvering? Don’t feel bad; I still have trouble–and I’m on my second child. What makes it especially tricky this time of year is when you’re wearing sandals or open-toed shoes, and you feel as though you’ve dented your foot. Ouch! 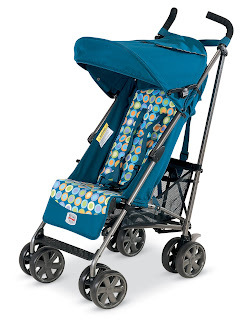 The Britax Blink Stroller aims to make this experience a little less painful. Thus umbrella stroller has a fold-and-release feature that lets you collapse the stroller without scuffing your shoes in the process. Amen to that. While some strollers skimp on storage space, Britax offers plenty of room to tuck in those essentials; I know I’m always trying to get my hands on that bag of Cheerios to calm a crying toddler. Blink accommodates riders up to 55 lbs., so know you can hang on to this model long after your little one has graduated to Goldfish. And in a whimsical retro-looking flower print, we love this fashionable, functional model. In a Nutshell: Don’t flip out if your flip flops can’t protect your feet. Maintain your Manolos with a stroller that has all the right moves.